Content creation is key for your business. It is crucial to regularly produce content or you will lose valuable traffic to a competitor. Knowing how to write an article optimized for SEO that will rank on the first page of Google is critical if you want to drive traffic to your site. It is a waste of time to create content if your content does not appear among the first couple of results. Selecting the right keywords is a big part of whether or not your content will rank. You can select the best keywords by writing a list of keywords that you are looking to target. Then go on Google Keyword Planner to see how competitive your keywords are and the average monthly searches for each keyword. For example, if you’re a plumber specializing in basement waterproofing, you might be looking to target keywords such as basement waterproofing, wet basement, and flooded basement. Or if you’re a financial advisor, you might be looking to target keywords such as financial advisor, financial planning, and financial management. The golden rule of white-hat SEO is to creating lengthy posts. When people spend more time on your site, it will lead to better rankings. Time on site is one of the most powerful metric when it comes to SEO. Writing shorter is easier and quicker, but writing content in long-form will outperform short content. You can write long posts by searching for a topic that you want to write about and condensing all of the information that the top 5-10 results present. Therefore, this will allow you to provide the most information out of all of your competitors so you can outrank them. When you use compelling meta titles and meta descriptions, this will increase your click-through rate (CTR). CTR is an important factor that Google takes into consideration when ranking sites. When it comes to your meta descriptions, you have have 160 characters to convey a general idea of your post. Make it count by leaving some cliffhanger at the end to make people inclined to read more. For example, if you’re looking for condos for sale North York, would you be inclined to click on a site with the metal title “Condo 3 bedroom North York – Trovit?” Below is an example of a good and bad meta title and meta description. You have to make sure you structure your SEO article using H tags to divide your content into sections. You can do this by using the H1 tag for the blog post title and H2, H3, H4 tags for your subheadings. You should also include images to make your content more engaging and use alt text on all your images. Take a look at Marble Tradition’s site. 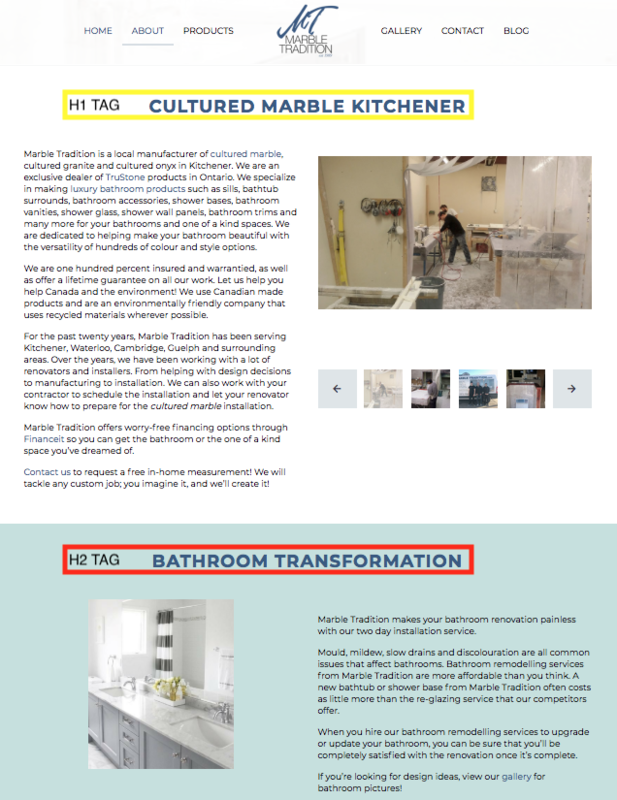 They are using the H1 tag for cultured marble Kitchener and H2 tag for bathroom transformation as their subheading. Your URL should include the main keyword that you’re looking to rank for that specific web page or blog post. You should try not to use stop words such as “a”, “to”, “an”, “the”, and “is” in your URL. Try these 5 steps on how to write SEO articles and let us know how your article did! You can comment on the article below or drop us a line at info@retailorsgroup.com. If you’re not regularly producing content, you will lose valuable traffic to a competitor. Let experts like Retailors Group help with your content generation and develop an SEO strategy that will drive more traffic to your site. We are your number one Content Marketing and SEO Toronto company!